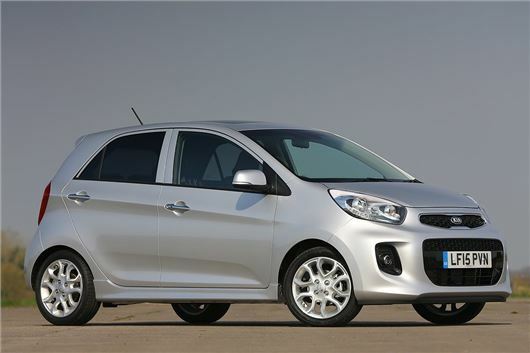 The updated Kia Picanto is available now with a start price of £8345. That gets you a three-door model – the entry-level five-door costs £200 more. The priciest model in the whole range is the Picanto ‘3’ 1.25-litre automatic, which costs £12,545. The basic ‘1’ trim is available in both three- and five-door body styles comes with fairly basic standard gear, including power steering and a height adjustable seat, but missing out on electric windows and mirrors. ‘1 Air’ trim adds air conditioning. SR7 trim adds 14-inch alloy wheels, air conditioning, automatic lights and tinted glass. Three and five-door versions are offered and prices start at £9845. Moving up to ‘2’ trim gains buyers creature comforts such as electric windows, USB/AUX connections. ‘2’ variants are only offered with five-doors. ‘3’ trim adds larger 15-inch alloy wheels, LED running lights, heated front seats, a more powerful audio system and steering wheel mounted audio controls. Moving up to ‘4’ trim adds a starter button, cruise control, a speed limiter and a heated steering wheel. Again, both ‘3’ and ‘4’ variants are only available with five doors. Two petrol engines are offered – a 1.0-litre three-cylinder with 69PS and a 1.25-litre 84PS. Official economy for the 1.0-litre is 67.3mpg, which equates to emissions of 99g/km or 95g/km with ISG, Kia’s stop start system. The 1.25-litre engine has emissions of as low as 100g/km with ISG, but this figure rises to 106g/km if you opt for a ‘3’ or ‘4’ trim level. Economy is 68.9mpg for the cleanest ‘2’ variant, dropping to 62.8 for the ‘3’ and ‘4’. There is also an automatic option which drops economy and increases emission further.